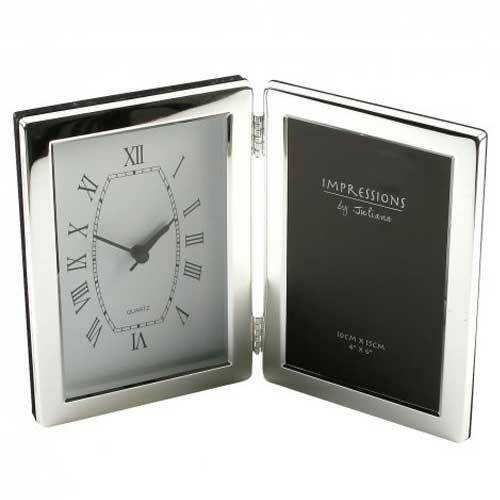 Impressions Silver Plated Hinged Photo Frame - 3.5 X 5"
Porreda Event Gifts > LADIES GIFTS | Clocks | Impressions Silver Plated Hinged Photo Frame - 3.5 X 5"
A silverplated hinged 3.5" x 5" aperture photo frame and clock from Impressions by Juliana. Featuring a Roman dial, black straight hands and a precise quartz movement. Requires 1 AA. Impressions is a world leading photo frame collection. Despite fewer photos being printed, Impressions goes from strength to strength producing over 1 million frames per year. From modern silverplated to classic resin designs, in both freestanding and wall hanging styles, we have everything you need to store your treasured photographs in style.